Redefining what it means to be a Southern belle. Spring has sprung, days are sunny, and there’s so much to be grateful for! 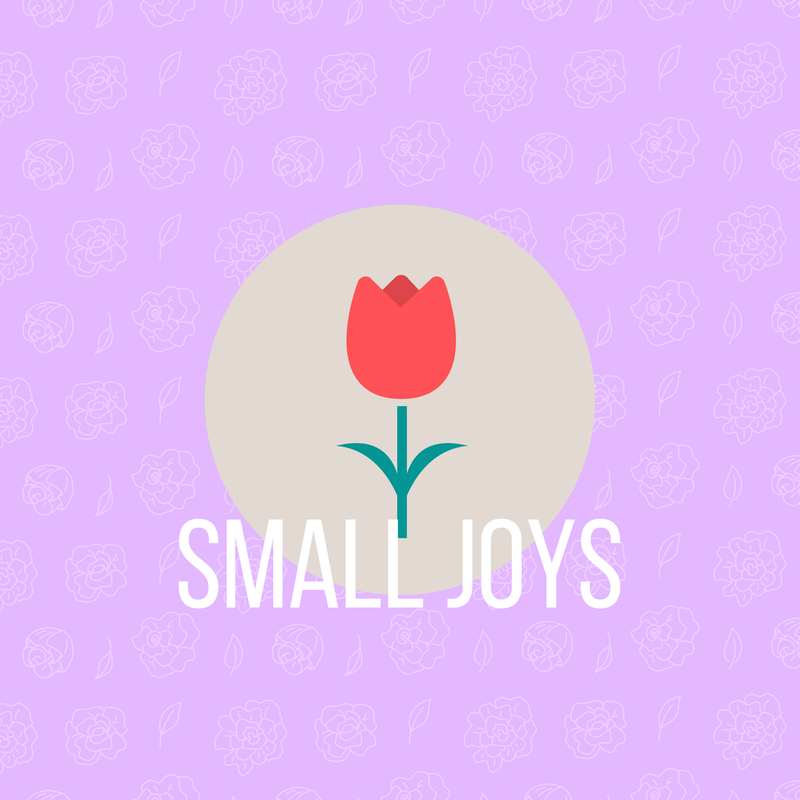 About time for another Small Joys post, right?? Actually, truth be told, I was struggling with some major discontentment this morning. After wallowing for a bit, I convinced myself that the best way to snap out of it was to cultivate gratitude. So, here I am! 1. Warmer weather! It is no secret that I am a summer girl through and through. I’ve been loving all of the sunshine and t-shirt weather we’ve been having lately. And, I love that it stays light outside so much later with the time change! This past week, we had dinner outside for the first time this spring, and it was glorious. 2. Y’all already know I love the Business with Purpose podcast. I just listened to Episode 20 with Jessica Honegger of Noonday Collection, and it is one of my favorites yet! She’s a very inspiring person. 3. Speaking of things I’ve been listening to…I finished Inferno by Dan Brown on audiobook last week. Gah! So good! I still like Angels & Demons and The Da Vinci Code better, but Inferno is excellent as well. 4. Birthday cards! Does anyone else have a hard time parting with cards? I am a major card hoarder. I can’t ever throw away cards right after they’ve been given to me, but I do try to go back periodically to purge. 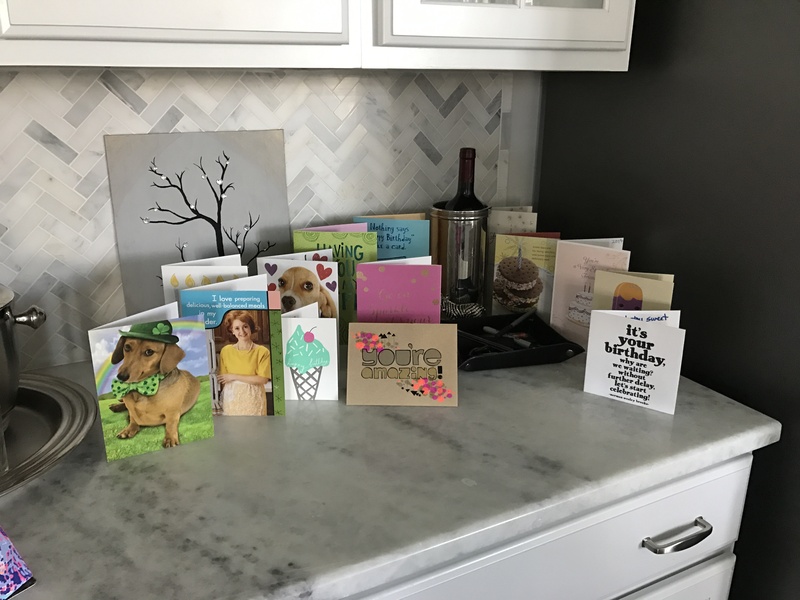 My birthday was a couple of weeks ago, and I’m still enjoying the little army of birthday cards on my kitchen counter. At what point is it no longer acceptable to have them on display?? 5. Gluten-free cake from JP’s Pastry. This exclusively gluten-free bakery based in Benson, NC, makes the BEST cakes! We bought a chocolate salted caramel layer cake to share with my family for my birthday, and everyone loved it. So much, in fact, that we forgot to take a photo of it before we dived in and demolished it. It’s always nice to find a gluten-free alternative that tastes just as good as the real thing! 6. My sparkly mermaid! Wes and I spent my birthday visiting Virginia Beach and Norfolk, where the city symbol is a mermaid. We tried to go to The Mermaid Factory, a Wine and Design-esque shop where you paint plaster mermaids, but they were already booked for the day. 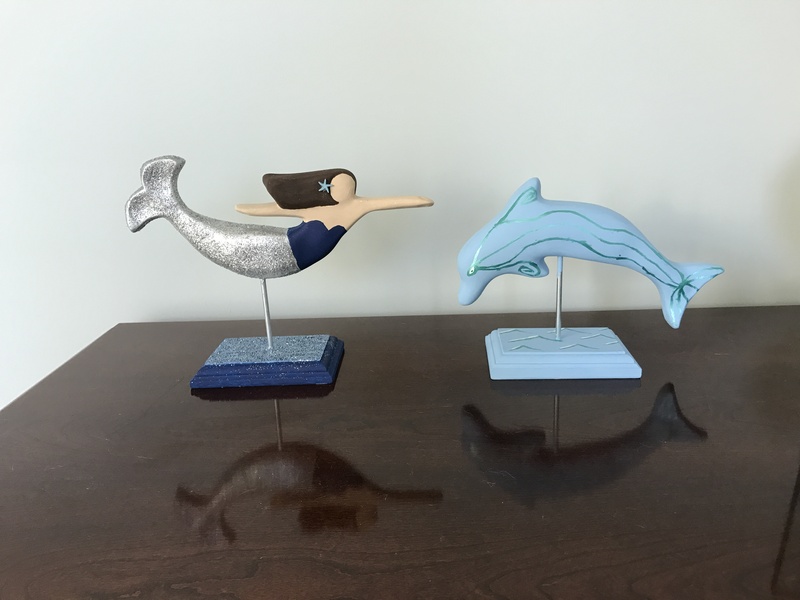 Instead, we purchased two of their take home kits and painted our mermaid and dolphin last weekend. It was a great way to relax, and now we have fun souvenirs from our trip! 7. Friends. Wes and I have been making our way through the entire series of Friends on Netflix for awhile now, watching a couple of episodes here and there. Now, we have only one season left, and I am distraught. I don’t want it to end!! Oh, and please don’t tell me how it’s going to end, unless you want to be dead to me. 8. This cornbread taco casserole. Made it this week and it is so, so good. I may or may not have eaten the leftovers for breakfast this morning. I actually love all of Mary Ross’s recipes! Most of them are gluten-free and vegan or can be modified to be gluten-free or vegan. I used regular dairy cheese on the casserole this week just to speed things up a bit, but her vegan cheese substitutes are really good. What are y’all joyful about lately? Let’s share and keep the gratitude flowing! Get ready for action! TOMORROW I will be posting on my insta stories asking a number of well known brands who made my clothes. These are some of my favorite brands that I used to buy from prior to making the switch to ethical fashion (ahem, @lillypulitzer @jcrew @target @anntaylor @loft @bananarepublic - go ahead and get your responses ready). 👚 The #whomademyclothes campaign is part of Fashion Revolution Week, a movement to bring awareness to the social injustices in our fashion industry and push fashion brands for greater supply chain transparency. Ultimately, the goal is that companies will see that we as consumers demand better treatment of the people making our clothes, and they will enact changes to make that happen. 👚 Learn more at @fash_rev and join me in this critical movement against human rights abuses and human trafficking! Let’s keep it that way. Happy Earth Day, y’all! 🌏 If you’re looking for ideas of ways to celebrate Earth Day, be sure to check out my latest blog post! Link in profile. Easter in my ethically thrifted Lilly Pulitzer. In my favorite Southern city. With a relatively un-creepy Easter bunny. This is the good life, y’all! Happy Easter! T-minus TWO days until Earth Day and Fashion Revolution Week!! If you’re wanting to do something for either of these occasions but need ideas, head over to the blog (link in profile) for suggestions of ways to participate! Not even a full weekend of rain can dampen how cheerful I feel in this ethically made dress! My friends at @theflourishmarket recently styled me in 4 big trends they’re seeing right now in the ethical fashion world. I’m giving you a sneak peek of trend #1 (my favorite one!) in this photo: patterns on patterns! 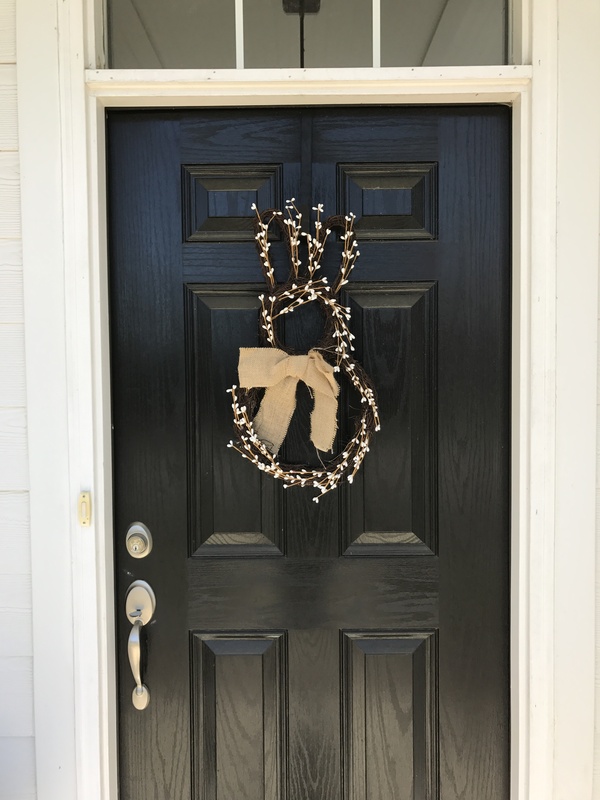 Check out all four on the blog and let me know which ones you like best! In my Sunday best over on the blog showing you two different ways to wear a pattern that’s showing up big time on the clothing racks this spring: Snakeskin!! Y’all have been asking for outfit styling posts, so I got some assistance from my friends over at my favorite ethical fashion boutique, @theflourishmarket, to style me up. Hop on over to the blog (link in profile) and let me know which snakeskin outfit you like best!